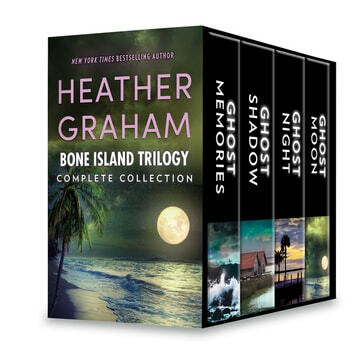 Now available for the first time in a complete box set, rediscover Bone Island, a trilogy of haunting suspense and thrilling romance, only from New York Times bestselling author Heather Graham. In the prequel to the trilogy, pirate Bartholomew Miller creates the curse that will haunt his island home for centuries. Katie O’Hara is drawn into an old unsolved murder—and irresistibly drawn to David Beckett, who may be guilty of killing his fiancée. Can the spirits of the past protect her? Massacre survivor Vanessa Loren is back on the islands for a documentary. Filmmaker Sean O’Hara understands that Vanessa’s ghostly visions hold clues to the violent history surrounding local pirate treasures. Officer Liam Beckett knows that some ghost stories are true; he vows to protect Kelsey Donovan as she returns to the old home of her grandfather, a recluse and collector, where things are not as they seem.